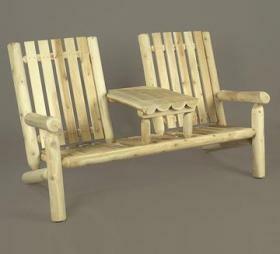 Take “tea for two” in this lightweight, smooth-sanded side-by-side seating by Rustic Cedar. The clever built-in table is just the right size for sharing. Solid cedar construction ensures years of carefree use. Cedar is also naturally resistant to decay, insect, and weather damage and, when left untreated, the creamy natural color weathers gracefully to a silvery grey.